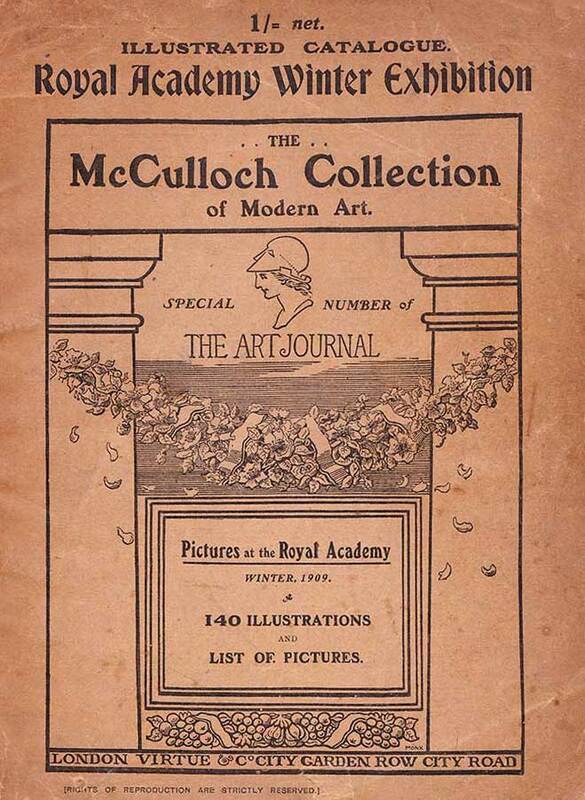 This page contains just a few photographs of the 140 or so illustrations in the special edition of the Art Journal of 1909 featuring the McCulloch Collection of Modern Art. A big thank you to historian David Wright of Brisbane, Australia for supplying these images. 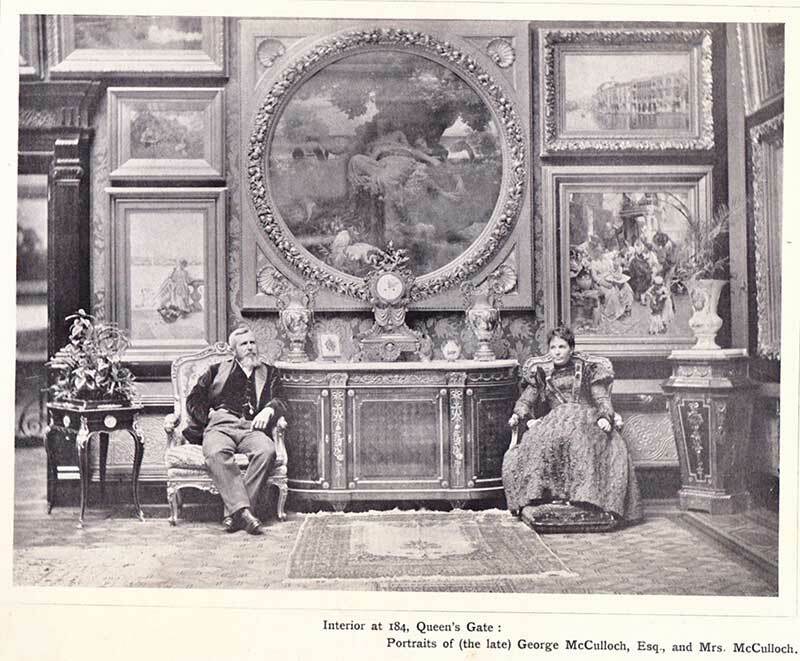 The photos feature George McCulloch who once owned the art collection, his wife Mary, his daughter-in-law Lesley, and his home at 184 Queen's Gate London. More information on the McCulloch's home at Queen's Gate can be found on the Royal Borough of Kensington website. The art collection was mostly sold and dispersed in 1913, and the building seriously damaged by enemy bombing in 1944; it was finally demolished in 1971. 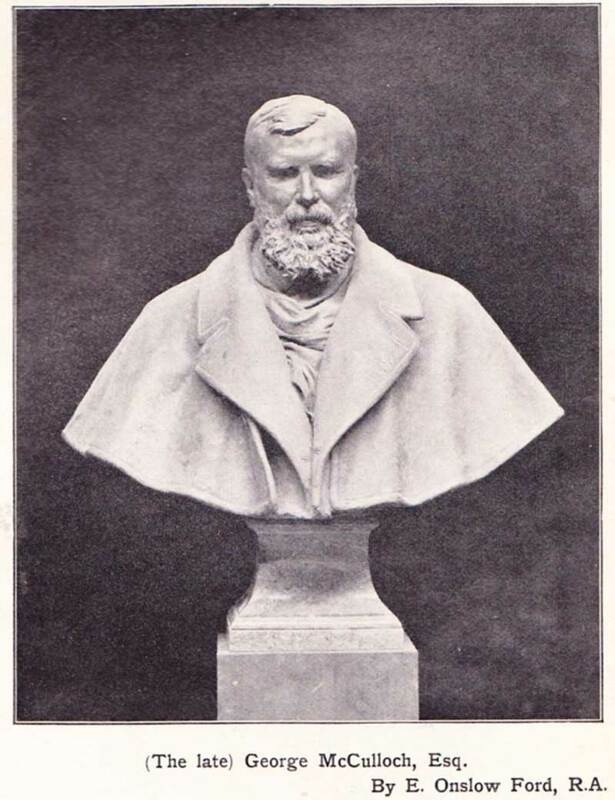 Three-quarter figure, standing facing the spectator: his right arm leaning on a table; brown coat, grey background. Signed and dated PAJ Dagnan-B, 28th April 1896. Canvas 50.5 by 38.5 inches. Does anyone know if this painting still exists and if so where it is? 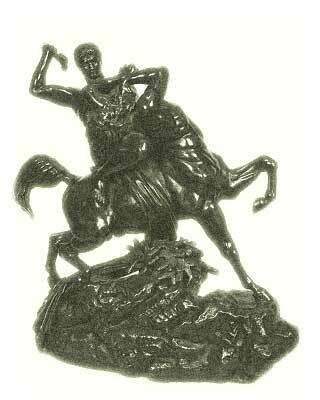 Though indistinct, we are certain the bronze on the table on McCulloch's right is 'Theseus Combating the Centaur Bianor' by French sculptor Antoine Louis Barye (1795 - 1875). See illustration opposite. Theseus is seen sitting astride the Centaur seemingly grasping its right arm, and about to strike a 'death' blow. Barye produced reproductions, in different sizes. and an example can be found at the National Gallery of Australia; there is a description of the work on the Dahesh Museum website. The sculpture is not recorded in the RA catalogue, but it's possible it was sold by McCulloch's widow and her third husband, the painter James Coutts Michie to help fund the building of their new 'arts and crafts' home at Hazlemere which they named Oak Hall; later the property became Wispers school for girls and it is now part of Wispers Park Retirement Village. Bust, bronze. Portrait of the late George McCulloch. 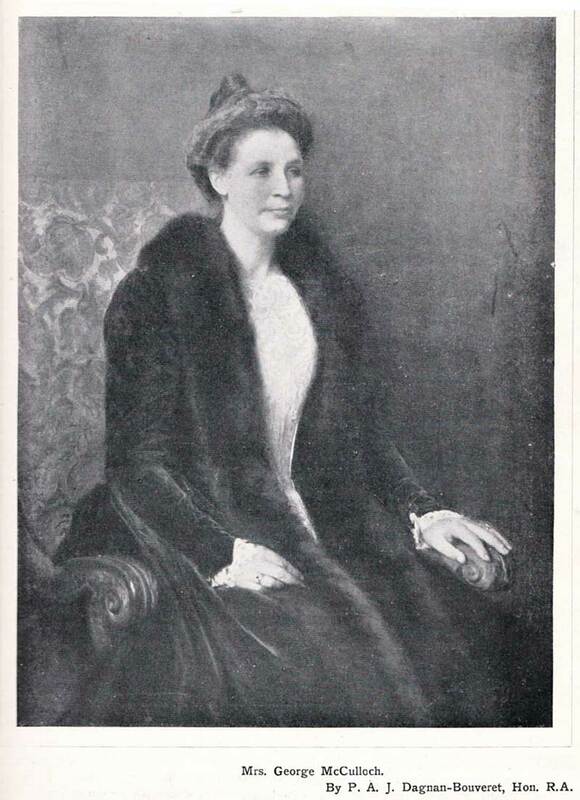 Three-quarter figure seated to right, her left hand resting on the arm of the chair; three-quarter profile; green fur trimmed dress; dark background. Signed and dated PAJ Dagnan-B, 1900. Canvas 50 by 38 inches. Three-quarter figure seated to right, holding a fan. Canvas 49 by 39.5 inches. Bust to left; blue dress and bonnet. 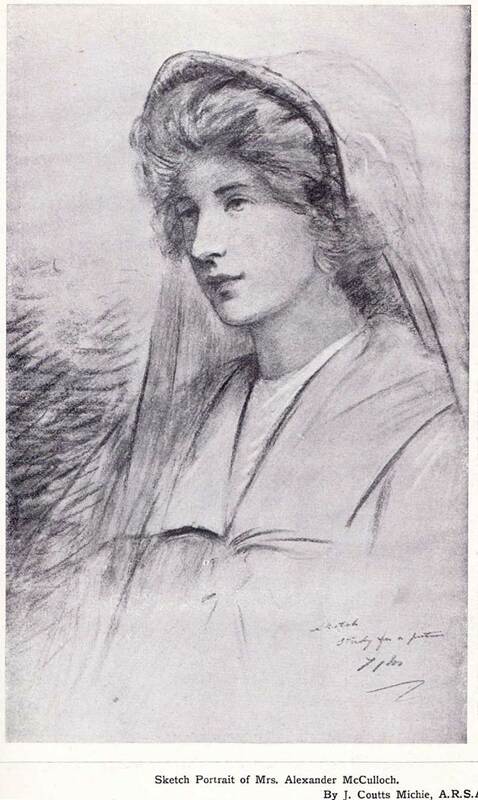 Inscribed, sketch study for a picture, JCM. Pastel 23 by 14.5 inches. She was born Lesley Maud Cecil Wright, the daughter of industrialist Alfred Cecil Wright. She married first Alexander McCulloch, Edinburgh 1907, and second, at London in 1938, Prince Abdullah Ben Ayad son of Mahmoud Ben Ayad of Tunis. The couple retired to Montreal in 1940 soon after the outbreak of WWII. Prince Abdul Ben Ayad died at Montreal in 1946, and Princess Lesley in 1951; buried Royal Mount Cemetery. During WWI Lesley's brother, John Allan Cecil Wright, joined the Royal Flying Corps and became a fighter pilot. Later he became MP for Erdington, Birmingham from 1936 to 1945. This photo from the Art Journal shows how George and Mary McCulloch displayed their art collection in their lavish home. Interestingly in the 1901 census McCulloch's occupation was recorded as a 'Retired Australian Squatter'. The large 'round' painting in the middle of the photo is The Garden of the Hesperides by Frederic Lord Leighton, 1892, that is now in the Lady Lever Art Gallery. 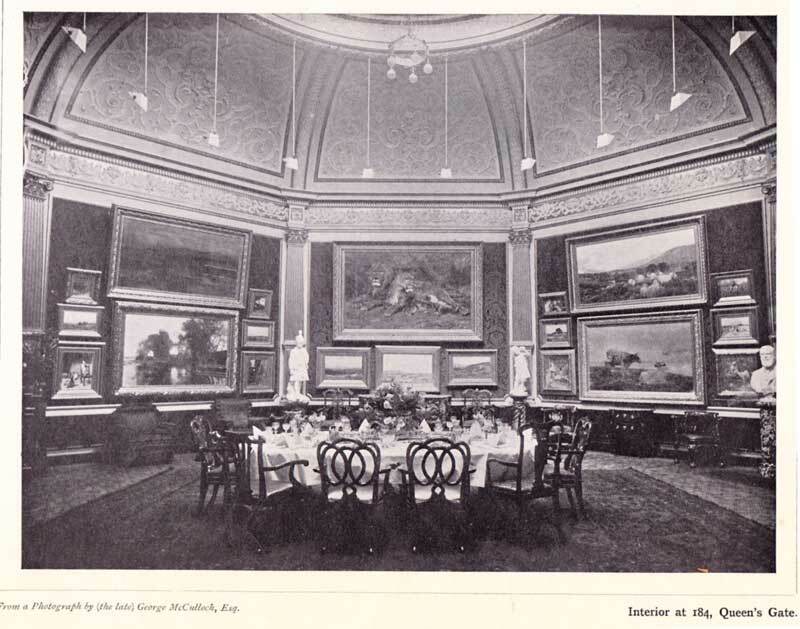 The photo below shows the 'circular' dining room at Queen's Gate. Note the electric lamps, and the painting 'The Lion at Home' by Rosa Bonheur on the wall opposite. This painting is now thought to be in the Ferens Art Gallery in Hull where it is much admired by children. Statue, marble. Master Alec McCulloch. Full length figure in Highland Costume, by F Vichi. To the right of the image is the bust of George McCulloch by Edward Onslow Ford mentioned above. Have been present at some interesting dinners in London. The best was one given on 'Varnishing Day' to a bunch of Royal Academicians by George McCulloch, the art patron who had made his fortune at Broken Hill. McCulloch had bought a freehold from the authorities of the Imperial Institute and built a house there to his own design. The dining-room was octagonal with eight arches leading into other rooms, the walls of which were covered with modern paintings. There were present some notable painters, EJ Poynter, Alfred East, Alfred Gilbert, David Murray, Bougereau, Vicat Cole and BW Leader. The only Philistines present were Mr RW Jeans, general manager of the Bank of Australasia, and myself. The dinner was excellent and well cooked. (Note: 'Varnishing Day' was a special event that took place at the Royal Academy of Art in London. Officially it was the day in which artists could touch up and varnish their paintings before the official opening of the Summer Exhibition. In reality, it was also a private viewing of the exhibition, in which artists, journalists and celebrities could meet and discuss the paintings before the exhibition opened to the public). Australian entrepreneur Hugh Donald McIntosh (1876 - 1942) in his memoirs wrote an account for the Sunday Mail May 5th 1940 about dining with McCulloch. This final photo shows Mrs McCulloch seated in front of some more paintings. On the left of the image is a painting of George McCulloch painted shortly before his death by the American painter John Singer Sargent. In the centre is the painting 'The Potato Gatherers' by the French painter Jules Bastien-Lepage, now in the National Gallery of Victoria, and to the right is a self portrait by Whistler. 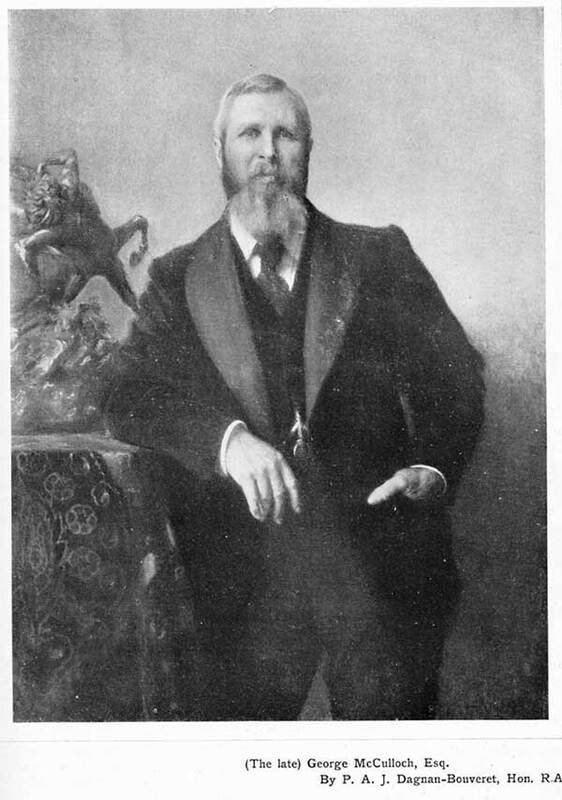 A portrait of George McCulloch hangs in the Broken Hill Art Gallery, New South Wales. This was thought to have been painted by an unknown artist named Manks, but recent research suggests the portrait was painted by the London based Welsh artist Barnett Samuel Marks RCA who also painted wealthy Australian merchant Jacob Montefiore. On 27th March 2013 Dr Gerard R Vaughan gave an interesting lecture entitled 'Australian Art Collectors Abroad', in the Dean's lecture series, at the Faculty of Arts, University of Melbourne. The lecture which contained a lot of information about George McCulloch was posted as a YouTube video, which sadly has subsequently been withdrawn. Maas Jeremy, Victorian Painters, 1969. Maas Jeremy, Victorian Art World in Photographs, 1984. The Grosvenor Gallery, a palace of art in Victorian England, Yale University Press, edited by Susan P. Casteras and Colleen Denney. 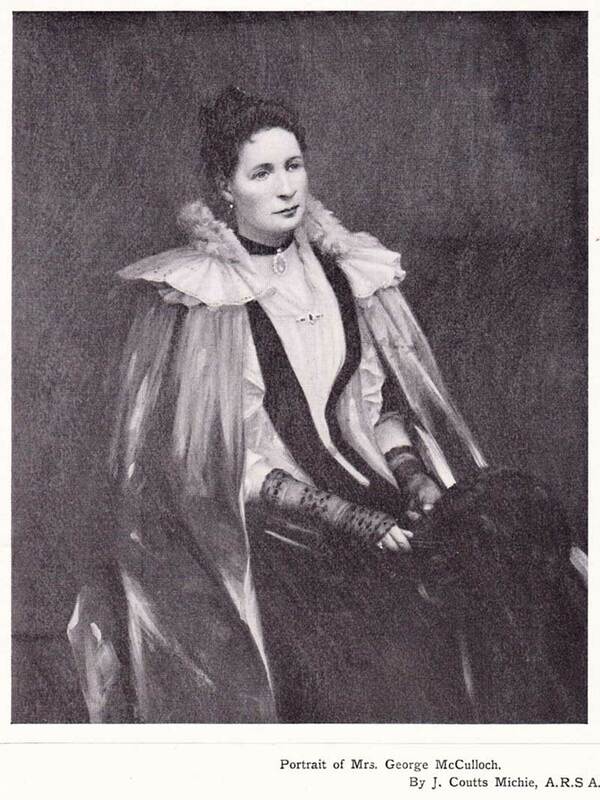 Dakers Caroline, The Holland Park Circle: Artists and Victorian Society, 1999. 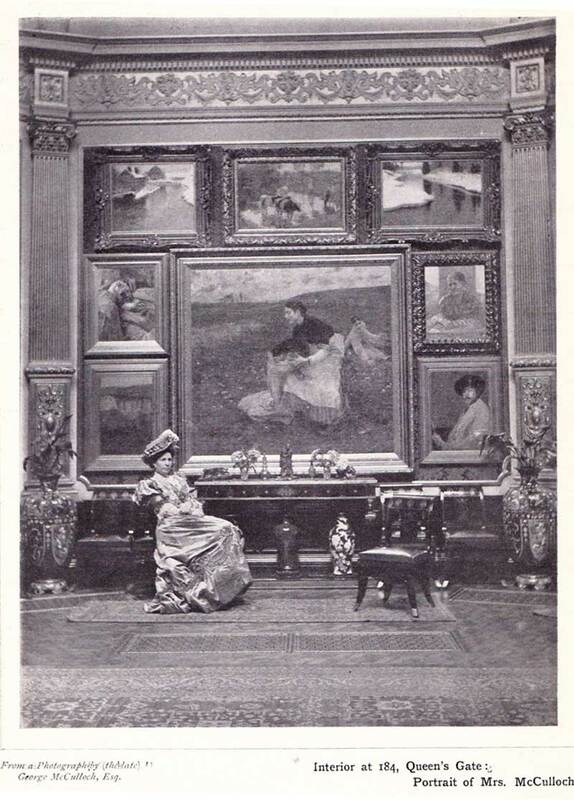 Catalogue of the Royal Academy Winter Exhibition, 1909. Special Edition of the Royal Academy Art Journal 1909. Billcliffe Roger, The Glasgow Boys. The Glasgow School of Painting 1875 - 1895, John Murray (publishers), first printed 1985. Woods Christopher, Dictionary of British Art Vol IV, Victorian Painters, published 1995. Volume 1, 'The Text' ISBN 1 851491716 (essentially a dictionary of British painters). Woods Christopher, Dictionary of British Art Vol IV, Victorian Painters, published 1995. Volume 2, 'Historical Survey and Plates' ISBN 1 851491724 (mostly black and white photographs of representative paintings). Please email suggestions for corrections or additions to this page to the webmaster, and feel free to let us know if any links have stopped working!